Would you laugh if we told you that skydiving parties are very much a thing? …and that they have a name? …and that that name is a kooky tradition from the 1960’s? Well, here it is, y’all: Skydiving get-togethers are definitely a thing, and they’re called “skydiving boogie”. (Ha!) Any given summer weekend, there will be several of these on the skydiving event calendar in the skies of every corner of the planet. Pretty much every dropzone in the world – no matter how small it is – boasts at least one yearly boogie to bring together its loyal local jumpers (and lots of visitors from far-flung provenance). Some of these events are much, much bigger than that: downright gargantuan flurries of falling people and ascending aircraft, sending jumpers of every discipline under the sun into the fray. From big to small, skydiving boogies are a reliably good time, and that’s why they’re such a revered tradition of the sport. So – What’s in a “Skydiving Boogie”? Until the “invention” of the skydiving boogie in the 1970s, skydivers only really got together in multi-dropzone-community groups to participate in USPA-officiated competitions. Specifically – at regional and national jump meets, kinda-sorta in the style of high school track teams. When the meet was over, everyone would go home to their own airfield and only really see each other again at the next one. Crumb, a fringey comic artist who was popular in the late 60s and early 70s, drew a popular motif called “the boogie man,” whose confident stride and motto (“Keep on truckin’…”) were said to have inspired Taggart’s use of the term. He was also probably influenced by use of the word in New Zealand skydiving circles, and he was very certainly inspired by the fact that “boogie” was the term popularized to describe an (ahem) pretty wild shindig. No matter where he got it, Taggart picked the word “boogie” to refer to his get-together — the “Richmond RW Festival” — on the all-important event t-shirts. Even though he misspelled it on the shirts themselves (and the party was so wild, the Indiana city that played host ended up banning skydiving for years afterward), the term stuck so hard that it’s still with us today. These days, the boogie is oh so very alive — especially at WNY! We love celebrating our Skyvan Boogie at WNY Skydiving, and we cleave as close as we can to the spirit of fun that Garth Taggart initiated. 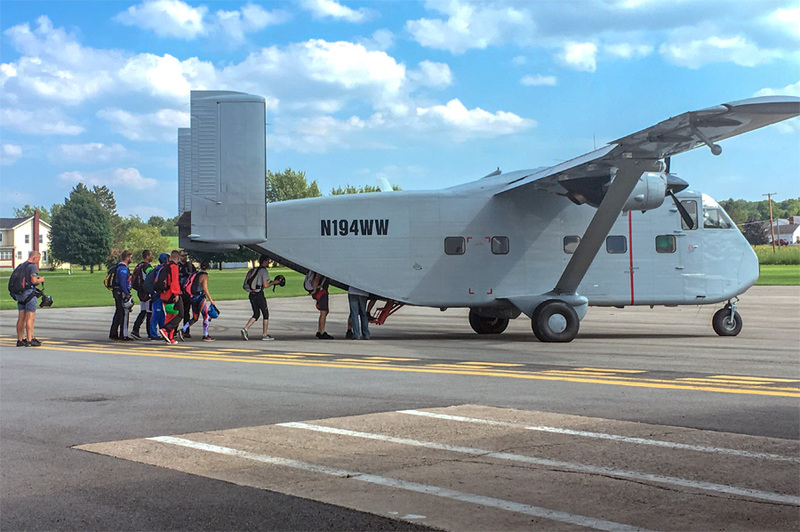 The Skyvan being loaded up at the 2018 Skydiving Boogie at WNY. We know you’re going to come for the jumps and you’re going to stay for the party, right? After all, it’s a fine tradition established by our hard-charging forebears. We’ll see you there!